Saba Mahmood is associate professor of anthropology at the University of California at Berkeley. She has been working for the past fifteen years in Egypt covering issues of Islamic politics, secularism and gender. She is the author of Politics of Piety (Princeton University Press, 2005) and co-author of Is Critique Secular? (University of California Press, 2010). Egypt’s workers, bloggers, youth and civil rights activists laid the groundwork for the revolution. 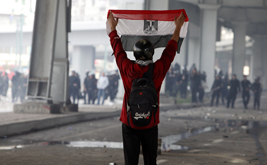 Will they be allowed to govern Egypt’s future?